Written by Walter Chen on June 29, 2015 . Sending an email to your entire list is one of the scariest things that you can do as a marketer. The moment you hit send, bad things may happen. Your email gets marked as spam. A valued customer unsubscribes. Or worst of all, total silence — no one opens, clicks, replies, or does anything. That makes you want to send email even less frequently — maybe once a month — because that feels safe. It’s counterintuitive, but sending email only once a month is actually your problem. “Sending one monthly marketing blast increases the likelihood that your emails aren’t relevant to your users.” Increasing your sending frequency (while avoiding annoying email blasts) also increases the chances for your emails to hit home with your subscribers. SumoMe founder and famous email marketer Noah Kagan takes this philosophy to an extreme. He uses an email marketing technique called double opens, which can increase email opens by 30%+ with 1 minute of work. With this technique, he sends at least 70% more email than most email marketers, and that drives massive business results. Here’s how he does it, and how you can increase any outcome — opens, clicks, signups, sales — by using Noah’s technique with your emails. For one recent email Noah sent on how to 10x email conversions, he had a 28.87% open rate. He changed the subject line and sent the same email again to non-opens only, and 7,031 more people (11.08% open rate) opened the email. That’s over 30% more opens than he would’ve gotten if he’d done nothing, with just 1 minute of work. Your fear may kick in as you begin to worry yourself into inaction and think about the bad things that might happen as a result of sending so much more email. But think about it another way — you succeeded in creating a more relevant subject line for a substantial segment of your subscriber list, and that compelled them to open an email that they had previously ignored or missed. You reframed your message and that enabled you to deliver value to the reader when it would’ve otherwise gone to waste. Go back to the underlying concept behind double opens and you start to see how it applies not just to email opens but also to every type of subscriber action, including clicks, in-app actions, conversions, sales, signups, and more. The idea is to send a subscriber variations on a single email until she takes the desired action. The thing is that if you have a SaaS app, you should already be doing this. We send a series of upgrade emails to new iDoneThis users towards the end of their free trial if they haven’t converted yet. When a potential customer’s trial is about to expire, you don’t just send a single email and pray that they’ll notice it and put down their credit card to convert. You email them a sequence of emails with increasing urgency that their trial is about to expire that stops when the customer converts or the account gets cancelled. Notice that our clicks and conversions are the highest on the last email. If we only sent a single trial expiration email, we would be wasting all of the tremendous effort we put into marketing to get a potential customer to sign up for a trial, all of the efforts of the customer support team in answering questions, and all of the efforts of the product and engineering team to build the product — just because we’re fearful that the customer will get annoyed by a few extra emails. Sound familiar? It only takes a couple of minutes to add a few variations to your lifecycle emails, and you get massive results. Here, for example, we’re seeing more than double the number of clicks and conversions we would otherwise get. Do justice to the value that you provide by sending enough email to give yourself a shot at making that message relevant to your customer. that allowed the team to drive towards a clear objective. They reframed the entire experience around that one simple premise because they had defined it in a way that expressed it as a function of product value. Once you have those clear objectives, you can similarly focus your emails to build your progress. Imagine being in charge of Facebook’s onboarding emails with the “7 friends in 10 days” goal. Rather than send one email about the poke feature here and another email describing the newsfeed there, you’d want your emails to work towards your one goal — in different ways. Keep in mind that open rates aren’t always 100% accurate. People can open an email and not get counted. So proceed with caution, in case you are sending to people who opened the email. That is, don’t do double-opens with every single email and ideally, vary the content so that it’s not a blatant resend. The lesson here is to send multiple emails, not for the sake of the same content, but to work towards the same goal. Double opens isn’t just a marketing hack to get more people to open your email. When done in a smart way, it’s about a commitment to forging a connection with your subscriber over your core value proposition. The twist is that you’ll only use double opens on emails that you believe in. That means that using double opens will help you to understand what’s really important about your email marketing. You’ll do more, focused work that’ll connect with your subscribers. 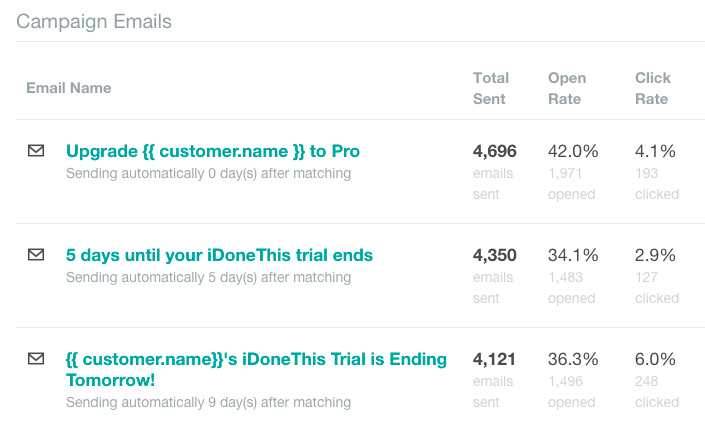 Your turn: How do you use your open rate performance for future emails? Comment below! Walter is the co-founder and CEO of iDoneThis, the easiest way to run a daily standup with your team. Follow him on Twitter at @smalter.